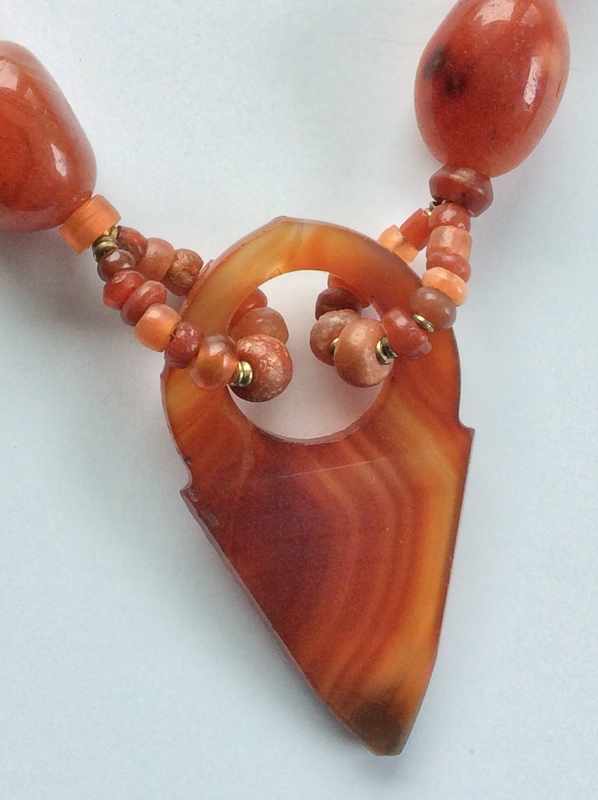 I do love carnelian. 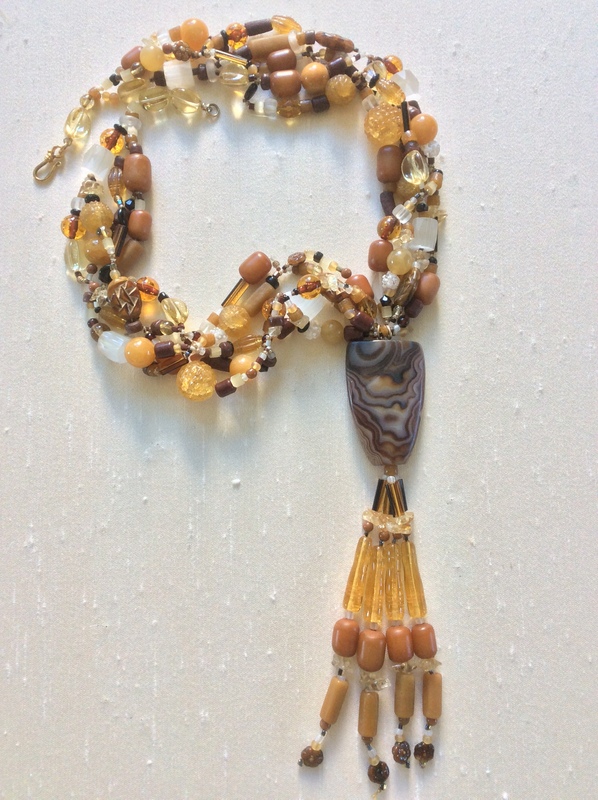 It is a semi-precious stone that is found in all shades of brown, almost every one tinged with orange. Now you know why I love it! I probably say I love this or that bead in every blog. I suppose that’s why I’m still beading 23 years on! 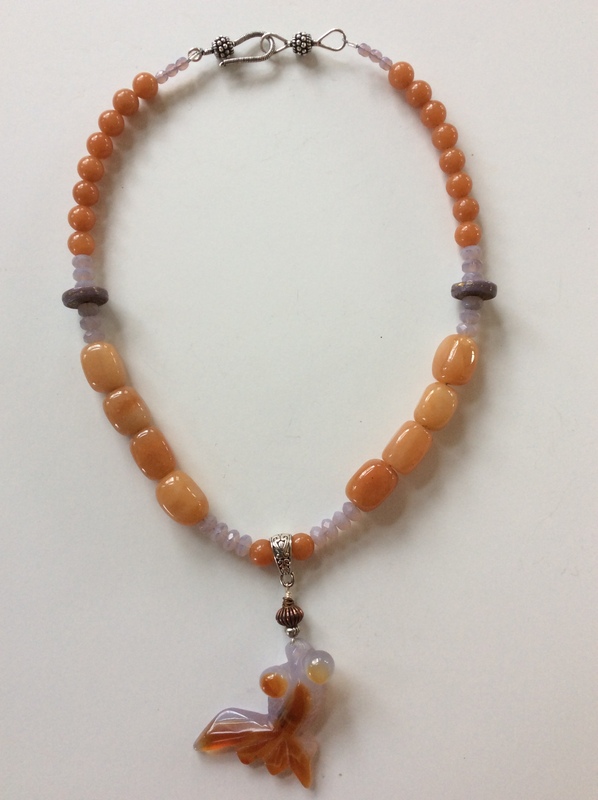 Carnelian is a member of the Quartz family. It is considered the stone of creativity, individuality and courage. 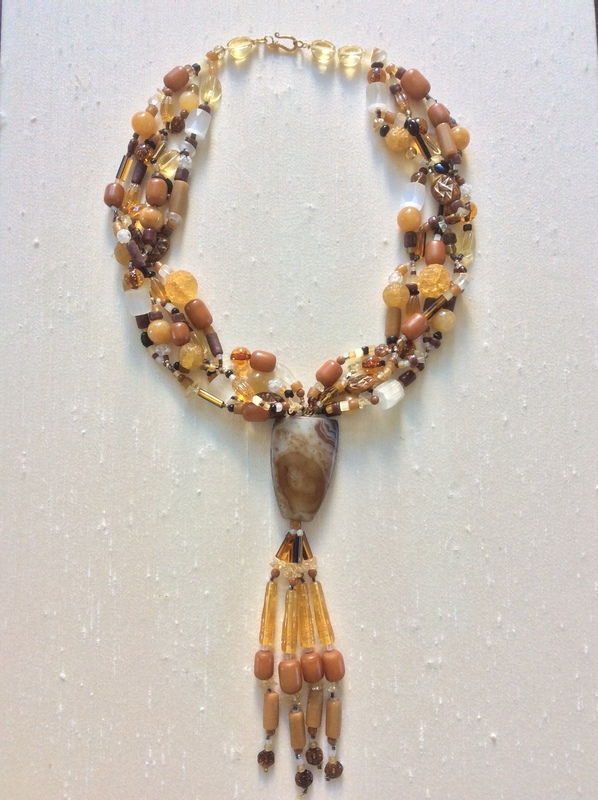 This necklace started with the centerpiece, named a talhakimt. 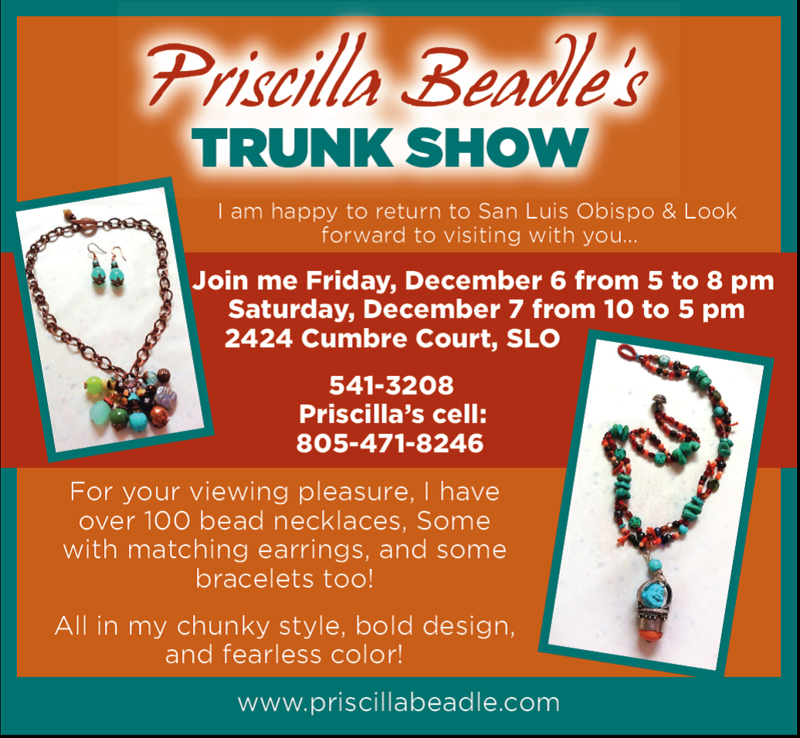 Over the years, I have purchased every interesting one I have seen and parcel them out into necklaces every few years. They are always based on the triangle/circle design. I have only one more truly interesting one left plus about 5 smaller ones that were originally men’s rings. The design feels very graphic and crisp to me; contemporary rather than ethnic. Talhakimts such as this one were carved of large banded agate in the nineteenth century in Idar-Oberstein, a famous stone cutting center in Germany, a location that means more to bead nuts than the less-obsessed. They were favored by the Tuareg people, pastoral nomads who controlled several Sahara trading routes, and are descendants of the true Berbers who predated the Romans in their settlements. This rare talisman adorned Tuareg women’s hair. I found it interesting to learn the Tuaregs are a matrilineal society. 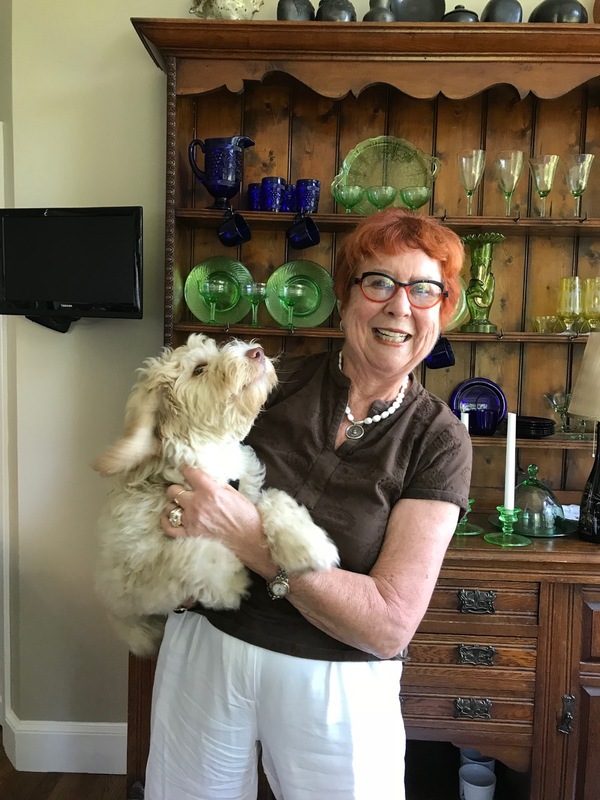 It is always a design challenge to figure out how to attach the unusual centerpieces, which I love to collect, to my necklace. 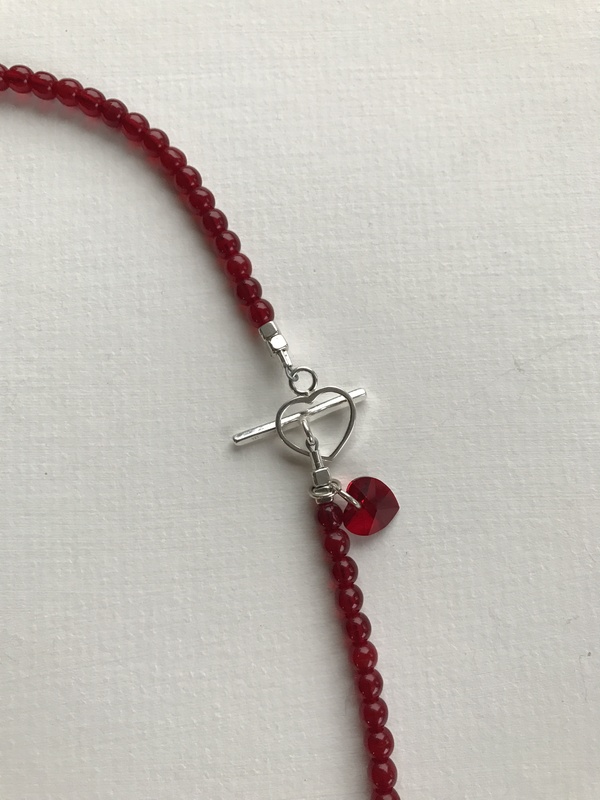 From the get-go I knew this necklace would be pure carnelian: therein was the attachment answer. I found a bag with some very old carnelian (see above photo) which was also small in size. 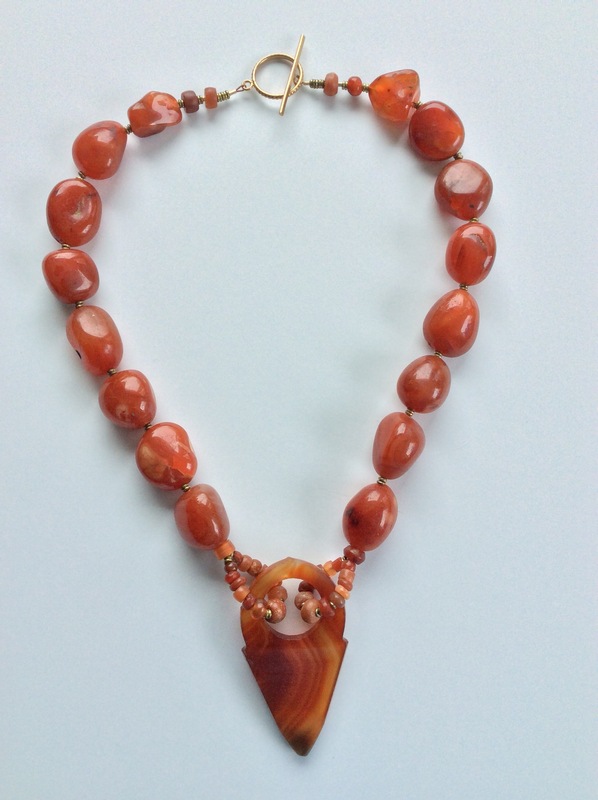 No two alike…all the better to see the varying colors of carnelian! Also notice their patina (wear)…visualize them a century ago in a Tuareg’s bag in a camel caravan travelling across the Sahara to a trading bazaar at the next oasis! 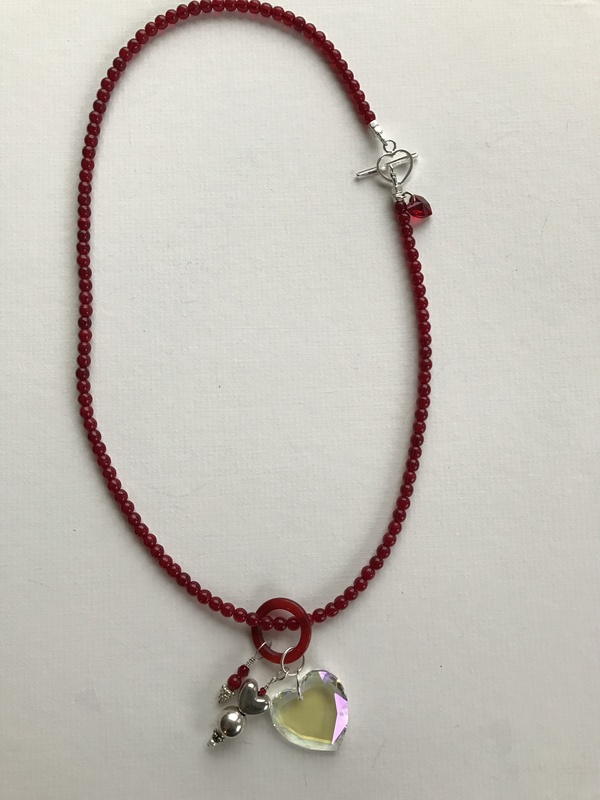 It should be no surprise that beads were money in many sociieties, from the Tuaregs to American Indians who invented heishi [pronounced “he she”], which are the small brass spacers used in this necklace. Our forebears, however, used shell as their money. 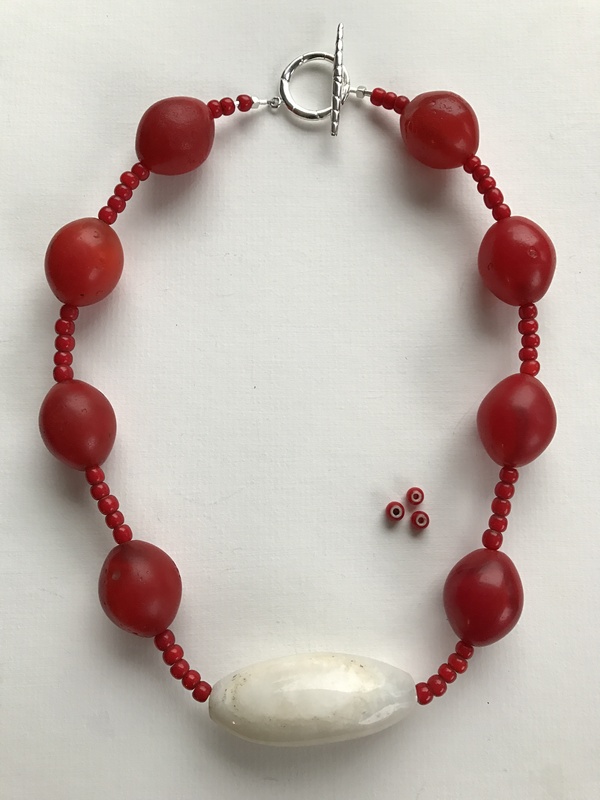 Today heishi are any small round beads made by hand from natural materials. 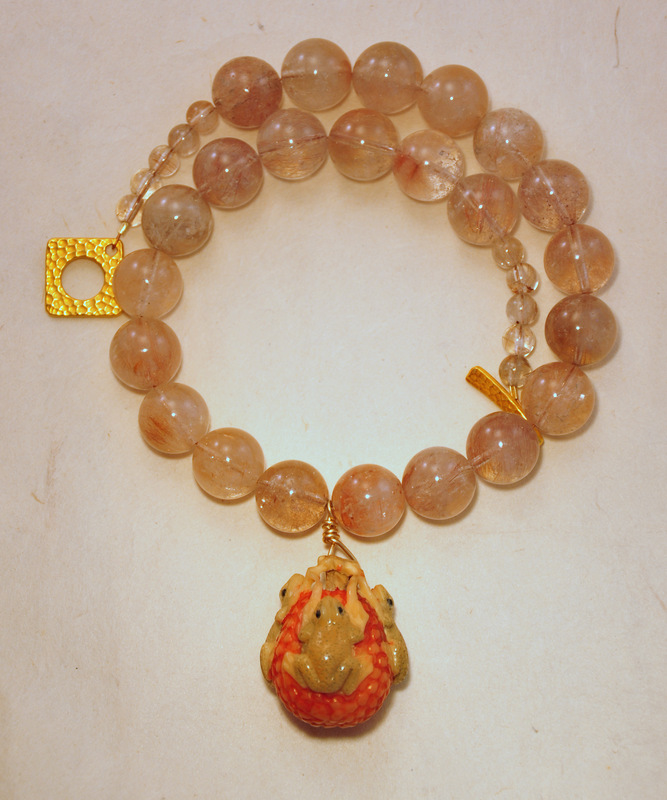 The necklace itself is designed with highly polished carnelian nuggets separated by brass heishi. 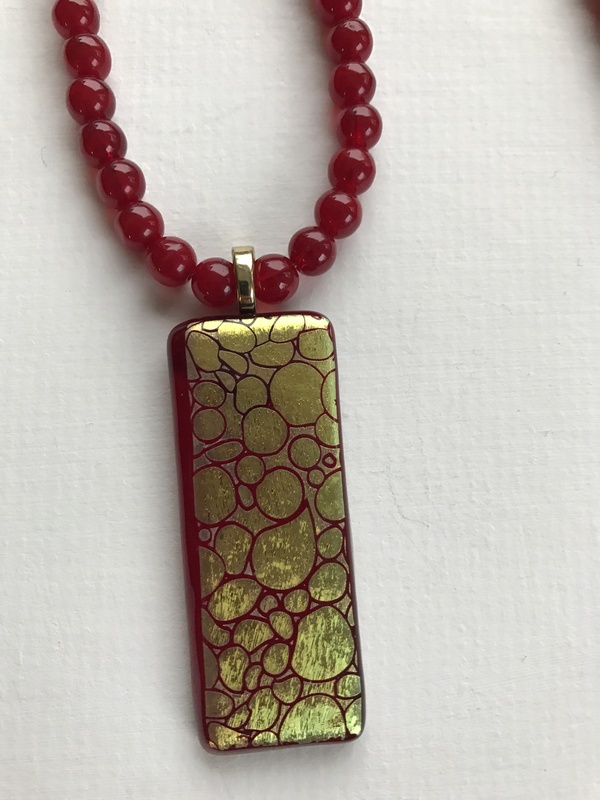 This necklace is 23” long with a brass clasp. The talhakimt is 3”. 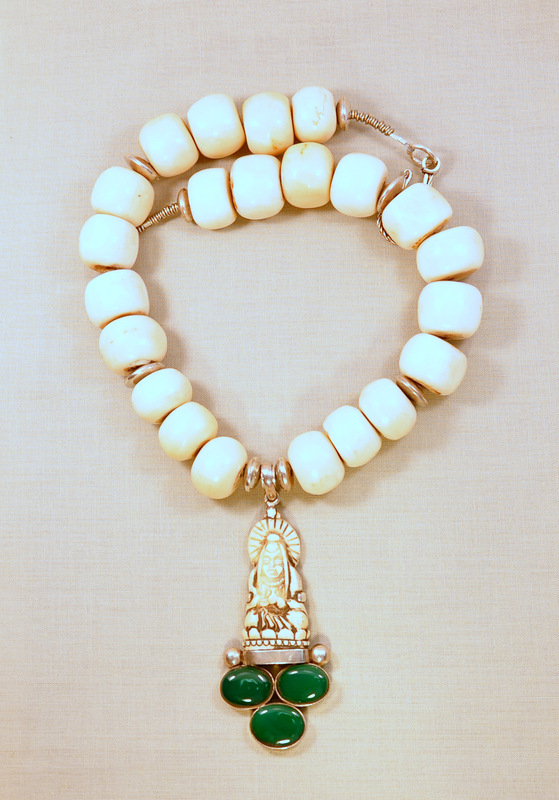 Wear with your gold earrings. $99. My Apothecary Chest: in 1994, it arrived via container in California from Hong Kong, where I discovered beading, after an ex-pat assignment there, to serve as the repository for my beads. Handcrafted. It has 52 Drawers. My Apothecary Chest has seven drawers across and seven down plus three large drawers as the bottom row. Each time I pull out a drawer, I admire the handcrafted dovetail details and the fascinating maroon black color of the interior. Sometimes I conjure a vision of the medicinal herbs it used to contain. Today, I celebrate reaching the end of the first row! In the third compartment of this drawer, a surprise awaited me. 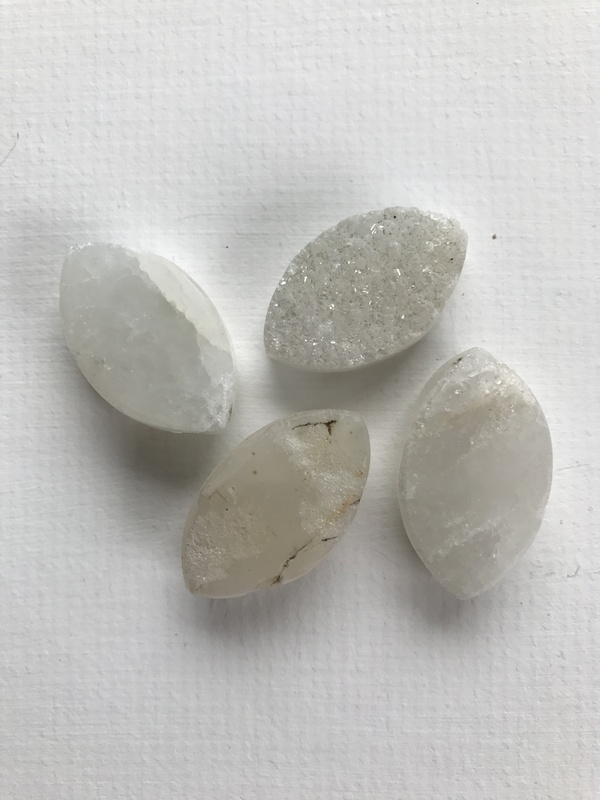 During a fabulous shopping spree at the 2015 Beadesigner International’s annual October show, I purchased three kinds of Druzy, packaged them together, stuck them in drawer 7 which was, and still is, a catchall for vaguely white beads. Today I present you the results. 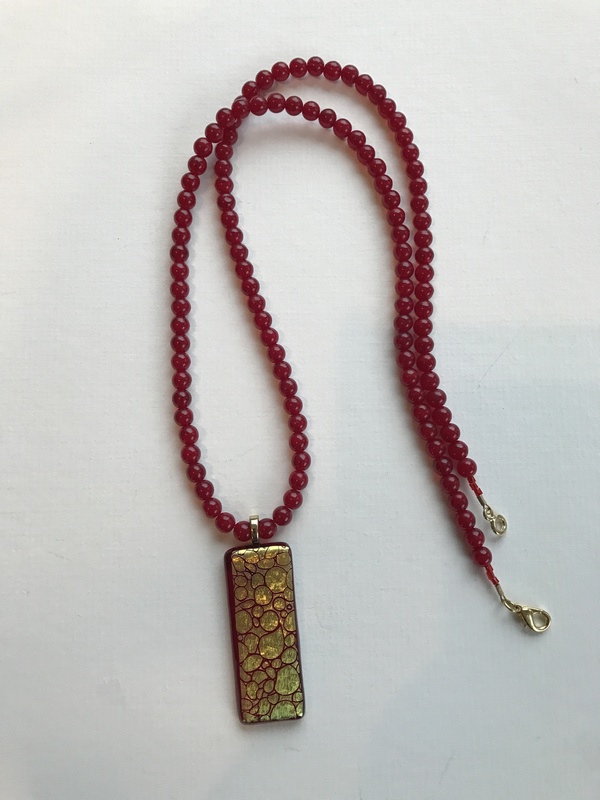 Druzy is the glittering effect of tiny crystals on top of a mature colorful mineral, often agate, appearing sparkley and delicate, but in reality, very durable. The agate substrate is polished to show off the mineral layers. The almond shaped off-white druzy are supported by delightful grey druzy. Druzy is easy to cut and the grey ones demand close inspection since each one exposes just a touch of crystalline sparkle. In a final step, these beads were electroplated to produce the satin finish. 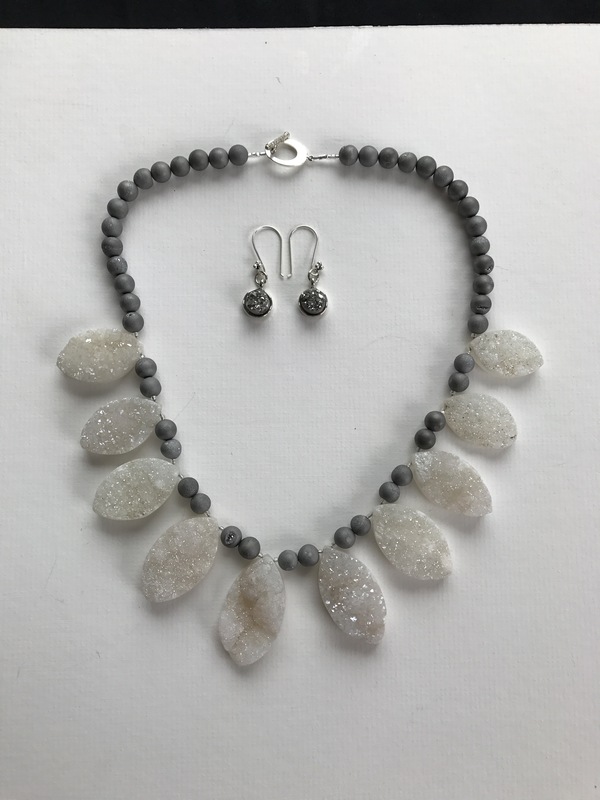 The silver druzy of the earrings compliments the white and grey druzy. 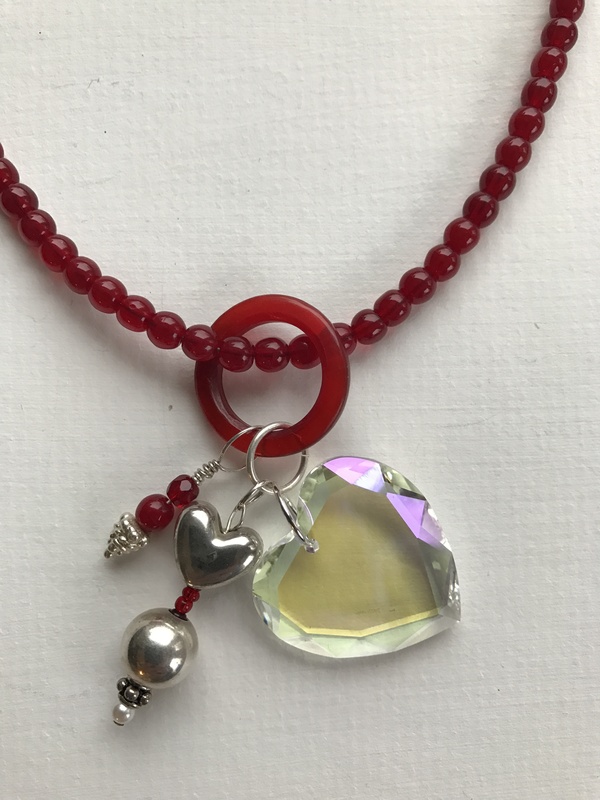 This necklace will enliven clothing of any solid color from pink to blue to black. In spite of its sparkle, it is quite conservative. It measures 20”. The set is $99.